&quot;Linda: I don't say he's a great man... He's not the finest character that ever lived. But he's a human being... Attention, attention must be finally paid to such a person. "Linda: I don't say he's a great man... He's not the finest character that ever lived. But he's a human being... Attention, attention must be finally paid to such a person. 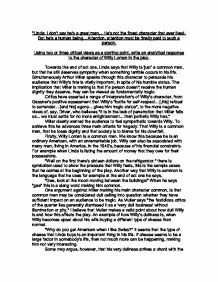 Using two or three critical views as a starting point, write an analytical response to the character of Willy Loman in the play. Towards the end of act one, Linda says that Willy is 'just' a common man, but that he still deserves sympathy when something terrible occurs in his life. Simultaneously Arthur Miller speaks through this character to persuade his audience that Willy's fate is vitally important, in spite of his humble status. The implication that Miller is making is that if a person doesn't receive the human dignity they deserve, they can be viewed as fundamentally tragic. Critics have asserted a range of interpretation's of Willy's character, from Gassner's positive assessment that Willy's "battle for self-respect... [,his] refusal to surrender... [and his] agony... gives him tragic status", to the more negative views of, say, Driver, who believes "It is in the lack of penetration that Miller fails us... we must settle for no more enlightenment... than pathetic Willy has." Miller clearly wanted the audience to feel sympathetic towards Willy. To achieve this he advances three main criteria for tragedy: That Willy is a common man, that he loses dignity and that society is to blame for his downfall. Firstly, Willy Loman is a common man. We know this because he is an ordinary American, with an unremarkable job. Willy can also be associated with many men, living in America, in the 1940's, because of his financial constraints. For example when Linda is listing the amount of money that they owe for their possessions. "Gee, look at the moon moving between the buildings!" When he says "gee" this is a slang word making him common. One argument against Miller making his main character common, is that common men may be considered dull calling into question whether they have sufficient impact on an audience to be tragic. As Muller says "the fastidious critics of the quarter lies generally dismissed it as a 'very dull business' without illumination or pity," I believe that Muller makes a valid point about how dull Willy is and how this affects the play. An example of how Willy’s dullness is, when Willy becomes upset about his wife buying a different type of cheese than normal. "Why do you get American when I like Swiss?" It seems that the type of cheese that Linda buys is an important thing in his life. If cheese seems to be a large factor in somebody’s life, then not much more can be happening, making him not very interesting. "Kid I can't take blood from a stone, I-" I believe that the way Howard calls Willy 'Kid' is patronizing and there is a condescending quality to this diminutive noun. Other aspects of Willy's experience which produce sympathy are his mental illness, how other people treat him and how he cannot give up. "Charley, look... I got my insurance to pay. If you could manage it - I need a hundred and ten dollars." The language used in this quotation is hesitant and embarrassed. He is losing his dignity because he has to admit defeat and ask for money making him seem pathetic and worthless. This may make an audience feel sympathetic towards him because he is desperate. Another example of Willy losing his dignity is at the end of the restaurant scene, when Willy is left on his own and Happy is embarrassed to call him his father. “No, that’s not my father. He’s just a guy…” This shows that Happy is embarrassed by his father’s behaviour and he is ashamed. This is also a very big lie and it is said without hesitation, showing that Happy is comfortable, lying about his father. I believe that it is pitiful, the fact that Willy’s children are ashamed of him. "Alright, stay in the bathroom... I think there's a law in Massachusetts about it," Willy is presumably referring to the law prohibiting potential adulterous behaviour. Personally, I cannot forgive Willy for this flaw, although others believe that because it was a common thing that happened that it could be forgiven. Other flaws that Willy has include: the way he treats his family, his mental illness and his ignorance to what is going on around him.Considering all of Willy's flaws, I believe that Vogel's point is too generous. Vogel says that the audience has "learnt the meaning of the tragedy of the salesman..." and that Miller has "awoken catharsis in us." In my opinion, I think that Willy's flaws cannot be forgiven and this creates a feeling of contempt rather than catharsis. Miller tries to persuade us that part of Willy's tragedy is created by American society and the materialistic views of that era. In the 1940's America had become a more technologically advanced country. The television had been invented, along with the world’s first computer and Americans were encouraged that ownership of this technology would make their lives better. This gave people financial problems. At this time the national debt was 43 billion dollars. Willy followed this trend by having the car, the refrigerator, the washing machine and the vacuum cleaner. Willy could not afford to buy these things out right, therefore was under pressure to make payments each month. This affected his mental state because not only did he have to provide for his family, but also had to earn extra to give his family these items that Americans were being persuaded were necessary. The American Dream is to be successful and envied without using a lot of effort. As Lorraine Hansberry says "something has indeed gone wrong with at least part of the American Dream, and Willy Loman is a victim of the detour." I believe that there is a lot wrong with the American and how it is misleading many people into believing that America is the key to success. However, not all of Willy's mistakes can be blamed on the American society, because Willy is able to think for himself. Also not everybody was miserable in the 1940's. This is also the era where people were successful, such as Sugar Ray Robinson and Joe Louis in boxing, Gary Cooper, Betty Davis, Judy Garland and Marlon Brando in film, and, Irving Shaw and Doctor Spock in literature. Aristotle’s tragic theory is that the character in question is a great man, who dies, after: undergoing a fall, having a tragic character flaw, at some point being subjected to some recognition of his flaws and making an audience feels pity and catharsis. One point that Aristotle made was that the hero of the story had to be a great man. In this play, it is the opposite. Willy is a common man living in America, with a stereotypical job, money problems, living in a normal house with a typical American family. He hasn't done anything great for society, or even for his family. But, does the fact that he is not a great man, make the audience less impressed or moved by his downfall? This is dubious. On one hand, the audience feel less sympathetic because he is quite ignorant of what is happening, and he didn’t try to help any situations. For example when he is in the garden planting seeds, he didn’t listen to what Linda said about nothing being able to grow in the garden. Also his flaws could have made him gain less sympathy because in some cases he was to blame, for example the way that he treated Linda, telling her to "shut up" all the time makes him seem rude and disrespectful. By treating Linda this way, he will not gain the audiences respect, making him fail in being a tragic hero. On the other hand, the audience are able to connect with Willy. As Popkin says Willy is "Everyman" meaning that he is a recognisable character in a realistic world. “I must make a train, William. There are several properties I’m looking at in Alaska.” This shows Ben’s success by the fact that he is looking to buy property whereas the audience know that Willy has to pay debts. This is also showing a contrast between the two characters. Another point made in Aristotle’s theory is that the character must have a flaw or be flawed. Once again this is true of Millers character, Willy. In my opinion, Willy's biggest flaw is how he is unfaithful to his wife, and how Biff, his son, finds out. "Go right over to where they're building the apartment house and get some sand." Although Willy is mentally ill, he is still conscious of what he is doing, therefore able to correct his mistakes. An additional point within Aristotle’s theory was that the character creates catharsis within an audience member. Catharsis is a relief of strong suppressed emotions, in this case through a piece of drama. Vogal agreed with this point when he said, Miller has "awoken catharsis in us." I believe that this all depends on how sympathetic the audience feels towards Willy. Somebody who feels upset about how Willy had spent his life would feel this way at the end of the play. But, if somebody didn't feel sympathetic about what happened to Willy throughout the play, would not feel catharsis, and could feel as if it was his own fault that all these bad things have happened to him. An arguable point made is whether Willy has a moment of self recognition, which is another point that Aristotle made. 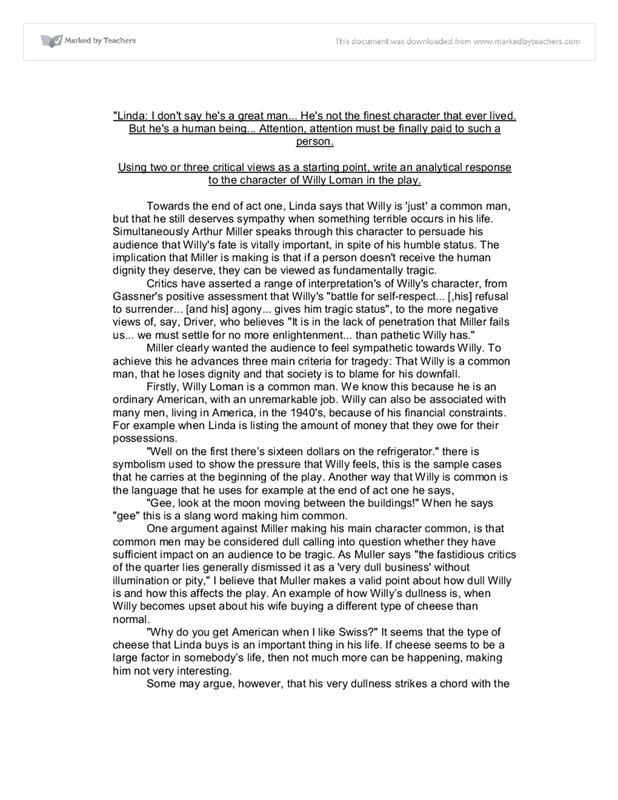 Some people may argue that Willy does have a point of self recognition because he kills himself, thinking that the family would come into money therefore making himself realise that he had failed to support his family. Another argument would be that Willy knew because of the way Ben spoke to him. For Ben, the American Dream made him successful. But, even though he was a strong believer, the American Dream didn't do anything for Willy. Other people may say that Willy didn't have a moment of self recognition because when times were hard, for example when he came back home from his business trip. He still had to do it all over again to try and gain success. People could also say that Willy didn't kill himself to help his family, but because of his mental illness. In my opinion Willy does have a moment of self recognition, because he thinks that killing himself and getting the insurance money is the best thing for his family. I also think that it is his mental illness that stops him from realising that they won't get any money because he is committing suicide. (About Aristotle’s theory being out of date.) Because a modern audience may suffer the same common tragedy as Willy does on this play. How does Willy Loman conform to the notion of a tragic hero? Willy tells of how he almost "hit a kid in Yonkers". This again shows his loss of control of his mind. We are told about his brother and how much he admires him. He describes him as "success incarnate". This means success made into a person. Aristotle Miller was aware of this definition "I'm his father and he's my son and if there's something bigger than that then I'll put a bullet through my head"p163 Bathos and irony Joe is a hero according to Campbell's definition "Forget now. Nevertheless, both Joe and Willy are effectively trapped in the success dream paradigm where: "Their attachment to success is closely linked to their perceptions of fatherhood or the father image.... In an attempt to authorise themselves as a breadwinner in the family, they desperately need something to support it. His illusions and constructed reality is falling apart. Biff wants to essentially leave behind all the lies and fake illusions and start a new beginning, one with his father relating to honesty. Willy, however, wants his sons to aid him in constructing a false truth. One that includes reliving the American Dream for him. A Tragic Hero should also have a fatal weakness, which leads to destruction and should find some degree of release and resignation when facing death. In the play we see Willy not being able to come to terms with reality. From this angle Willy Loman could be considered to be of 'noble standing'. Furthermore, if only nobility can grasp the emotional concept of tragedy, then why do the average people enjoy the idea of a tragedy in a play? The average person is capable of a fortune reversal, whatever standing they are. First she reduces his position in life admitting, "I don't say he's a great man...He's not the finest character that ever lived." So it is actually made plain that Loman is not anyone 'special'. But she then says, "...he's a human being...attention must finally be paid to such a person,"